IDF fighter jets target two Hamas underground structures in Gaza in retaliation for rocket attack on southern Israel. IDF fighter jets on Saturday night targeted two Hamas underground structures in the Gaza Strip. 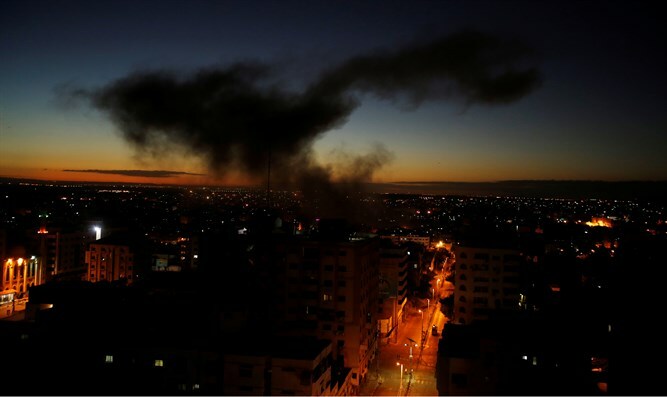 The air strike was in retaliation for a rocket that was launched from Gaza towards Israeli territory earlier on Saturday. “We will continue operating to defend Israeli civilians,” said the IDF Spokesperson’s Unit. The rocket that was fired from Gaza exploded in an open area without causing physical injuries or damage. A siren was activated in seven communities in the Sha’ar Hanegev and Sdot Negev Regional Councils, and the residents entered protected areas. The IDF Spokesperson’s Unit confirmed that one rocket was fired from the Gaza Strip into Israeli territory. On Friday, IDF aircraft targeted two Hamas military posts following violent riots on the Gaza border, in which 13,000 Gazan rioters threw grenades and explosives. There were three incidents of Gazans breaking through the border fence into Israel. The soldiers stopped them before they could reach the homes of Israeli families who live minutes away. “The IDF holds Hamas responsible for all violence that emanates from the Gaza Strip,” the IDF Spokesperson stressed. The Hamas-run “health ministry” in Gaza claimed Israeli forces shot dead a Palestinian Arab woman during the violent border riots, reported AFP. Since March 30, Gaza Arabs have held weekly riots along the border, dubbed the “March of the Return”. The violent border riots in the past included Gazans attempting to infiltrate into Israel, as well as using kites and balloons with explosives attached in order to set fire to Israeli property. In recent weeks, the protests had not been as violent as they had been when they started. However, the violence flared up again on Friday, likely due to the fact that Israel halted the transfer of Qatari money into Gaza, following escalation in the south earlier this week.